Leyna and Kristen joined the lab during their freshman year, both love amphibians and reptiles and their conservation. While they have worked on a variety of herpetological projects in the lab, they are conducting their Honors Thesis projects on (Leyna) the spatial ecology of the Striped Mud Turtle (Kinosternon baurii) at Circle B Bar Ranch Reserve and (Kristen) the comparative diversity of gopher tortoise burrow commensals in natural vs. restored tortoise populations in central Florida. Both plan to attend graduate school upon graduation. In 2016, after an exciting Junior Journey (i.e., Study Abroad) trip to Forfar Field Station on Andros Island in the Bahamas, Katie and Spencer decided to join my lab's efforts to document the parasites that infect Bahamian lizards. Both have (or will be) making independent trips back to Andros Island to collect additional samples to determine if parasite assemblages vary seasonally in Anolis lizards. They are pictured climbing along the edge of a blue hole, which are common on Andros. Kylie officially joined the lab in the fall of 2017 to conduct her Honors Thesis project on the distribution and abundance of rat lungworm (Angiostrongylus cantonensis) by sampling terrestrial and semi-aquatic snails in central Florida. The lungworm parasite is zoonotic, see: https://www.livescience.com/59651-rat-lungworm-florida.html. Kylie is interested in pursing graduate work in public health. Abby completed her Honors Thesis on "Aspects of the life cycle of Apharyngostrigea pipientis in central Florida wetlands", and she did an excellent job presenting her results at the annual meeting of the Southeastern Society of Parasitologists. Abby also worked on the transmission of Gyrinicola batrachiensis before leaving for Auburn University College of Veterinary Medicine in 2017. Abby is a world traveler, working with rhinos in South Africa and Musk Oxen in Alaska. Sean loves birds, especially raptors! So what is he doing in my lab? Well, Sean works hard, loves biology, and has a secondary interest in parasitology, so he fits in well. He has done an excellent job working with Jasmine on the nematomorph and Gyrinicola projects this summer (2014). Sean will be working this fall on a project that tests the carnivorous nature of Cuban Tree Frog tadpoles, which appear to consume native species (and conspecifics) under certain environmental conditions. After a couple of years in the lab, we turned Sean into a herpetologist, and Sean moved to Kansas to pursue a graduate degree in herpetology! Jasmine is an honors student and student athlete (Volleyball) at FSC that I recruited to join the lab in her sophomore year to work on the Nematomorph NSF-ROA collaboration with Dr. Bolek's lab. We have continued this project into a second summer (2014) thanks to FSC's Faculty-Student Summer Collaboration grant, and we have worked simultaneous on a large mesocosm and lab experiment to explore the reproductive ecology of a nematode that parasitizes tadpoles, the worm is called Gyrinicola batrachiensis. Jasmine already presented the preliminary results of the nematomorph project at SSP, and she will be presenting a poster on the topic at ASP in New Orleans in 2014. She comes from an academic family (mom is a faculty member at Ball State), and she plans to pursue a PhD on the evolutionary biology of parasites upon graduation. She is pictured holding a Siren; her mesocosm experiment is picture on the far right (she is on the far end). 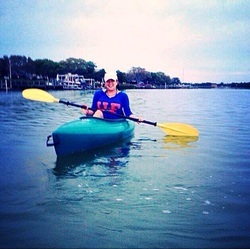 Trey joined the lab during his sophomore year and has worked on a variety of projects over the past two years. 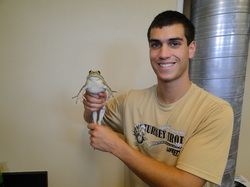 He has decided to tackle an ambitious project for his senior honors thesis: elucidating the life cycle of a species of Mesocoelium that is exceedingly common in local native toads (Bufo terrestris) and the invasive cane toad (Bufo marinus). This project will simultaneously serve as the first survey of parasites from cane toads in Florida. Trey also participated in the NSF ROA collaboration between Dr. Bolek's lab at Oklahoma State University and our lab; he is pictured in the middle of the photo to the right, where we were collecting snails to search for nematomorph cysts in Payne Co., Oklahoma. Trey is planning to attend medical school after graduation. These two directed the Turtle Team's efforts for the past 3 years, and we are currently working to write a manuscript on the turtle assemblage in Lake Hollingsworth. Bryan plans to attend graduate school to continue his work with turtles. 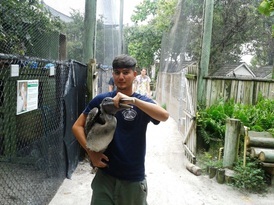 In addition to working on his degree, Bryan earned certification as an Advanced Florida Master Naturalist. He is pictured holding a Siren. Ashley recently graduated and is working in St Pete, FL, and she is pictured on the right. It appears living in St Pete is rough. These three presented their senior research project at SSP entitled: "A seasonal survey of the helminths of bluegill (Lepomis macrochirus) collected from two lakes in central Florida". In addition to some relatively common helminths of bluegill, they found a large number of Ergasulus spp. (pictured). Middle photo shows them hard at work capturing fish with a cast net and processing them; far right displays the hazards of fishing from the shoreline in Florida. All three recently graduated in May 2014! As an aspiring veterinarian, Katerine decided to conduct her honors thesis on the parasites found in the feces of two local big cat animal rescues, including the follow species: tiger (Panthera tigris), lion (Panethera leo), leopard (Panthera pardus), cougar (Puma concolor), serval (Leptailurus serval), and bobcat (Lynx rufus) . She spent many hours in the lab looking through slide smears, which paid off when she found several different helminth and protozoan species in some of the cats. She presented a final report to both cat resuces on the species found and the apparent effectiveness of their current anti-parasitic treatments. She presented her results in 2014 at the annual meeting of the Southeastern Society of Parasitologists on the Georgia Southern campus. Katherine will be starting Vet School Fall 14 at the University of Tennessee! She is pictured at a Tennessee wildlife area. During a standard parasitological survey of the Cuban Tree Frog, Jessee discovered a fascinating annelid parasite, Dero hylae. Along with Trey and Jasmine, we recently submitted a manuscript on the life history of this worm to the Journal of Parasitology. The worms are pictured to the right. Portia (an honors student) worked on several aspects of the life cycle and ecology (in a mesocosm experiment with multiple tadpole species) of Apharyngostrigea pipientis, a trematode that uses tadpoles as 2nd intermediate hosts (1st = the snail Biomphalaria havanensis) before reproducing in the final host, wading birds. The photo to the right shows a cercariae (circled in yellow) just prior to the tadpole sucking it up (oral infection); the far right photo shows the metacercariae removed from near the tadpoles's heart 15 days post infection. Portia presented her findings at FSC's Fiat Lux showcase, and she is now in medical school in Tennessee! The A. pipientis system is an on-going project in the lab, so any interested students should feel free to talk to Dr. Langford about this worm. Christina recently won FSC's Honors Program Senior Thesis award for her research on the life cycle and host specificity of frog lung flukes (Haematoloechus varioplexis and Haematoloechus floedae) from Southern Leopard Frogs and Pig Frogs collected in our campus wetland called Southern Landing. Congrats Cristina! She is planning to attend PA school in the near future. Cristina holding her award at her study site. 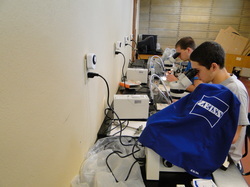 Luiz joined the lab his freshman year. He knocked on my door the first week of classes and asked to conduct research on parasites. I chuckled a little bit, but told him if he stuck around for the entire semester I would find a project for him. Well, Luiz surprised me and has done a fantastic job. He is working with Brent on the Cyrtosomum project. Luiz also is working to help describe a new species of anuran nasal mite discovered by Mike Politis (see below). Luiz plans to attend medical school. 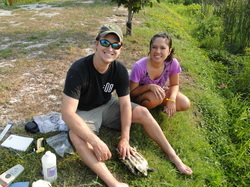 Jon Scott and Han Nguyen worked tirelessly spring and summer 2011 to establish "Turtle Team". 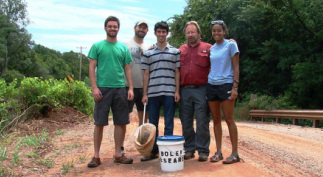 Turtle Team is a long-term effort to study the community ecology of freshwater turtles in Lake Hollingsworth and introduce students to field biology. George Geibel and Ashley Pelegrin will be the primary students overseeing the turtle traps summer 2012 (now that the turtle trap theft issues appear to be resolved). Jon is now in Dental school, and Han is in Podiatry school. Brent's project involves determining the life cycle and host specificity of the nematode Cyrtosomum penneri that infects local lizards. He is a member of FSC's ROTC program and plans to peruse a medical degree. Brent received a FSC student-faculty collaborative research grant to work on this project. Good job Brent! Brent's work was published in the Journal of Parasitology. He is now a med student. 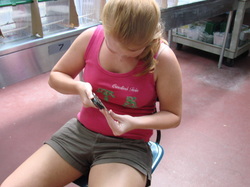 Jen is working on a project that explores phenotypic plasticity in Anolis sagrei leg length. Her project is based on a follow-up question to a study by Losos et al. 2000. She is an expert lizard hunter! Jen is currently studying for the GRE and plans to attend PA school. Jen's co-adviser is Joe Macedonia. Chris picked-up on this project following Jen's graduation, and their combined worked was published in the Journal of Herpetology. Chris is now in Vet school. 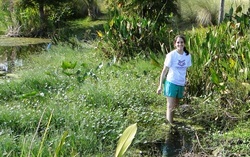 Jen conducted a parasite community study of local freshwater fishes in Lake Hollingsworth. She presented her research at FSC's Fiat Lux annual meeting and won the best oral presentation award. Jen is now a medical student at USF. Congratulations Jen! Mike worked with my favorite animals, frogs. He conducted a helminth community survey of leopard and pig frogs from Southern Landing, a campus wetland. He found a lot of interesting parasites, including a potentially new species of ereynetid mite from the nasal passages of leopard frogs. We are currently describing the species, however our progress has slowed now that Mike has been accepted to medical school. Congratulations Mike! Suhail worked with me at the University of Nebraska in the Janovy lab. He studied the co-occurrence of Haematoleuchus and Rhabdias in the plains leopard frogs from a stream in eastern Nebraska. Suhail won the best oral presentation award at the 2009 annual meeting of the Southwestern Association of Parasitologists. He is now persuing his Master's degree in parasitology with Matthew Bolek at Oklahoma State University. Suhail (far right) in a western Nebraska stream.